is a residential and commercial painting contractor company specializing in custom painting in both the interior and exterior of your project. In more than 20 years we have developed skills to satisfy the most finicky of clientele. We have been serving Long Island throughout Nassau and Suffolk County, especially the 'east end', giving to the Hamptons the quality of service that it deserves. For all your Painting projects of any size, large or small, we do hope you will consider Claudio's Painting Corp, call us today for a free estimate. At Claudio's Painting Corp, we provide our customers with the highest quality product and workmanship. We deliver the most creative designs on time and have a solid reputation for quality workmanship throughout Nassau and Suffolk County. 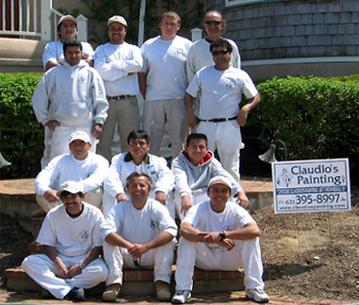 At Claudio's Painting we are fully insured with liability and workman's compensation insurance. You can trust in our knowledge in new or re-paint any size project , large or small commercial buildings. Claudio's Painting have an excellent track record for prompt service and we work closely with supervisors to monitor daily progress on construction sites and meet required deadlines. Claudio, thank you very much, everything looks great!! You and your guys did a beautiful job, as always. And thanks for finishing on time. We were at the house this week. The paint job looks very good, I am quite happy and want to thank you and your team for the good work. Please use me as a reference! I hope to see you soon.